Ever wondered if there was a volcano under your home? Well, now you can find out by using the British Geological Survey's (BGS) new OpenGeoscience portal. It allows the public to study all the UK's rocks on a simple Google map, down to a "scale" of 1:50,000. Toggling the map shows overlying towns and streets. 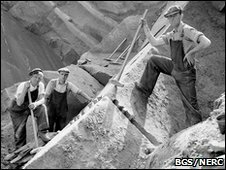 A range of educational and professional tools are also brought together on the website, including the huge national geological archive of photographs. Tens of thousands of images have been amassed into the BGS library over the decades, showing different rock forms around Britain, fossil types, and the impact on the landscape of natural events such as flooding. The whole archive is now searchable and free to use for non-commercial purposes. "Even if you have very little geological knowledge, I'm sure it will be fascinating to zoom into your street and instead of seeing an aerial photograph, see the colourful geology underneath," said Dr Keith Westhead, head of Information Delivery at the BGS. "We don't know all the uses people will put this information to, but what we're hoping is that they'll think of new and creative things to do with it." The map data is also available at the smaller scale of 1:625,000. The website allows professional and amateur geologists to pull the information into virtual globe software which enables them to manipulate it further and mesh it with other types of data. At the 1:50,000 scale, geological details down to about 50m on the surface can be resolved - essentially street level. The BGS says this is a world first in terms of releasing country-wide information. Those who live in Edinburgh, for example, can see how their city is built on top of an ancient volcano. Glaswegians on the other hand will notice that their city is built on the remains of an ancient tropical forest, evident in the coal measures and fossil trees that can be seen today. Regular drivers of the M1 motorway between Leicester and Loughborough might be interested to study how their route passes across some of the oldest rocks in England that preserve the remains of soft-bodied animals which once lived in an ancient sea. And going further south still, the residents of Cornwall can observe how the Lizard Peninsula contains a slice of ancient ocean floor that has been thrust up on to the margin of the continent. "It's certainly going to appeal to people who have a strong amateur interest in geology. It is also a wonderful educational resource," said Dr Westhead. "It will be very useful for schools and universities to include in their teaching materials. If they want to show off a fascinating piece of geology - sandstones, granites or quarries - they just need to type that into the search engine and they can pick up hundreds of pictures to use in presentations." The archive includes all the iconic rock features you would expect to find - such as the famous Durdle Door sea arch on Dorset's "Jurassic Coast" - but also some exquisite pictures of fossil forms, many taken in the early 20th Century by the renowned palaeobotanist Robert Kidston. The digital colour map of the UK has a proud history. The BGS itself has been making geological maps of Britain for 175 years. The very first national geological map (of England and Wales) was completed in 1815 by William Smith, one of the "founding fathers" of modern geology. "People like him would have been fascinated I am sure to see what we can do now," said Dr Westhead.